We hear a lot about the China’s vast problems. They are very real and could have major consequences. But economic reality isn’t black and white. At any given time, both good things and bad things are happening. Ignoring one side because it doesn’t fit your preferred outlook is an excellent way to go badly wrong. This article is my attempt to demonstrate that China has good news, and even some fabulously great news, much of it quite compelling. Let’s begin with economic growth. In the US, we are excited at the prospect of seeing 3% real GDP growth this year. In China, that would represent an unprecedented crash. Here are the annual changes from 2010–2017, with IMF forecasts for 2018–2022. Now, you can fairly ask how reliable this data is. 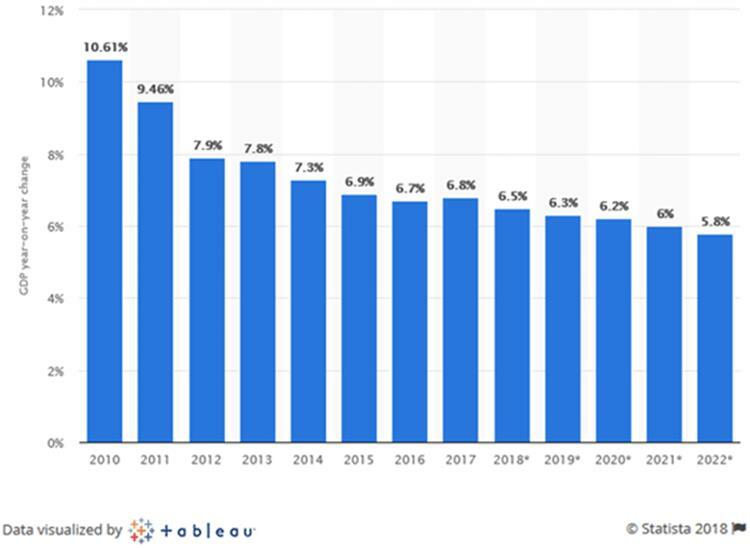 But I have no doubt Chinese growth is far greater than any other developed country including the US in the last decade. Yet I constantly hear predictions that China’s growth days are over. Peterson Institute economist Nicholas Lardy argued that personal consumption data—which is harder to manipulate—is more in line with economic growth. He says this is more meaningful than retail spending since China’s fast-growing middle class spends much of its income on services like education and healthcare. 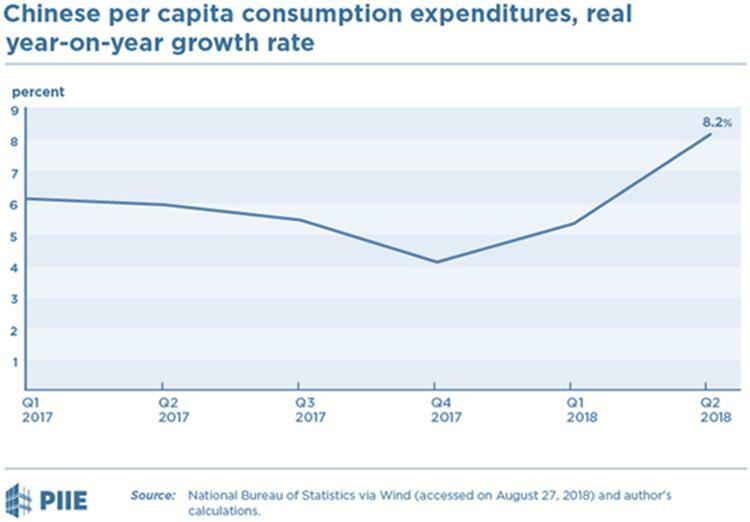 And as you can see in the chart below, consumption in China has been strong lately. So, if consumption is growing, the remaining threat to GDP growth would be falling exports. Trade tensions could hurt China, but that hasn’t happened yet. And China is already working to replace any lost US sales. 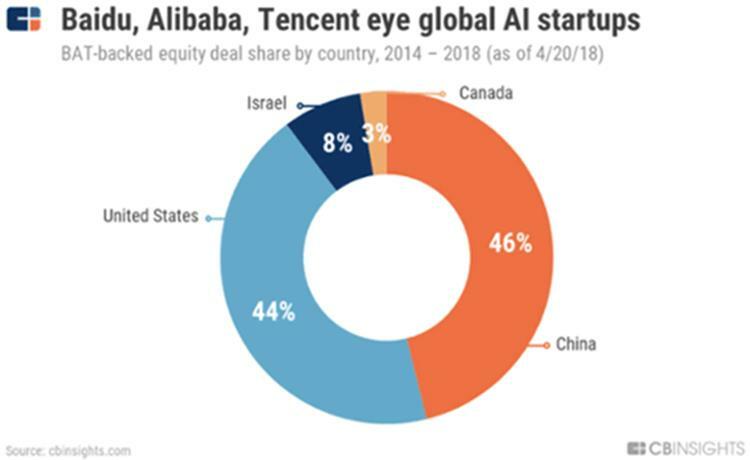 The question for companies like Alibaba (BABA), China’s e-commerce juggernaut and Amazon.com (AMZN) is how far outside their home countries they can expand. Alibaba took a big step in that direction. On the sidelines of the Xi Jinping-Vladimir Putin summit in Vladivostok, Alibaba said it was buying a 10% stake in Russian internet giant Mail.Ru Group. They plan to use the latter’s Russian social networks to build an e-commerce platform and develop a new conduit for Chinese exports to Russia. It will be a while before Russian consumers buy enough online goods to replace what China will lose in US exports if the trade war continues, but Chinese businesses are not at the mercy of US trade policy. Combine this with China’s massive “One Belt, One Road” infrastructure initiative, and you can see where the game is going. Beijing intends to dominate as much of the Asian economy as it can. North America and Western Europe aren’t going anywhere, but we aren’t the world’s growth centers anymore. Of course, now hundreds of American companies operate in China, but the Chinese government has a ring fence around certain segments. That’s one reason China has 9 of the world’s top 20 tech companies. 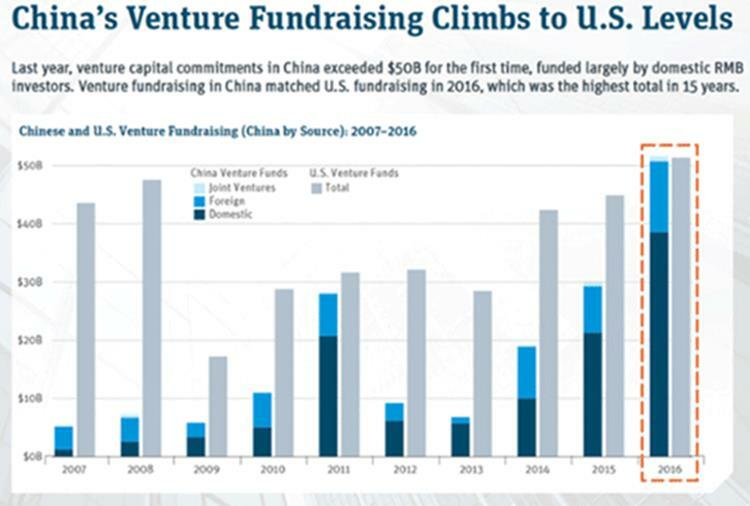 In fact, Chinese venture capital is now over $50 billion and roughly at the US level. Let’s look at BAT-backed startups, for instance. China is a growing competitive force, and the rest of the world needs to step up its game. This is good from a strictly human perspective. Competition makes everybody improve their services and products. We believe that for US companies, but it’s true on a world scale as well.